If you manage or own a building that has a rubber roof covered with rock you know first hand how frustrating it can be to find roof leaks. 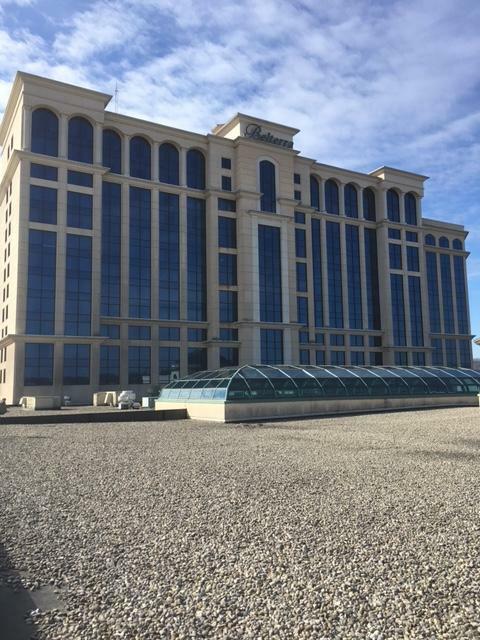 Ballasted rubber roofs are very common in Indiana and found throughout the Midwest. The large stone or ballast does protect the rubber roofing from the sun’s rays but its main function is to simply hold the rubber roofing down. 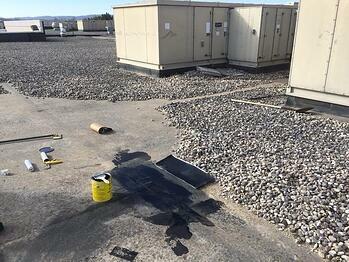 Ballasted rubber roofs aren't glued down but loosed laid. The only part that is glued is the seams between the rubber sheets and even then the rubber is only glued to itself and not the roof deck, the exception being parapet walls are usually fully adhered or glued on. 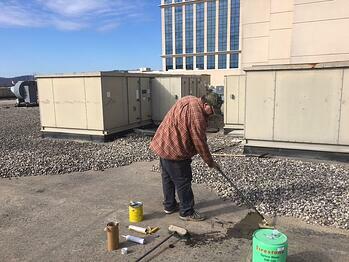 At Exterior Pro we find and fix rubber roofing leaks on ballasted flat roofs routinely, here is a basic outline of the process we use to locate these leaks. In a building or structure without a ceiling this may be as simple as looking up to see water falling or taking short ladder to remove a ceiling tile. In other situations finding where the water is coming through and into the building may involve large ladders or even a man-lift. 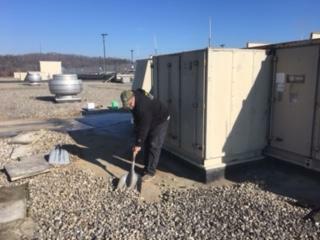 Regardless of how difficult it is to access the leak area from the inside of the building you have to make your best effort to be as specific as possible, after all you are getting ready to move rock and the better job you do finding out exactly where the water is coming in at could mean you move less rock roof side. Once you have found where water is coming through the rubber roof mark the spot and try to use things like exterior door and windows or even light post or walls to help you get directly on top of leak once you go roof side. Keep in mind water can travel especially in rubber roofing situations. Try to get up close and personal with the bottom side of the roof deck to see what’s really going on. Once you’ve climbed on top of the rubber roof, use your landmarks or building features to get as close as possible to the section of the building where the water was coming in. Now, using a plastic shovel without a metal strip on the end begin to gently remove rock away from the area that the leak is occurring. The trick here is to move enough stone to find and fix the rubber roof leak without removing so much stone that the roof has nothing to hold it down, remember that the rock is holding the rubber in place. Avoid putting all the rock you move into on large pile it seems to make moving it back more difficult and if the leak would happen to be under the pile of rock you just made you would have created a lot more work for yourself. All the work you have done up to this point is all for just a chance to find the rubber roof leak. With a little luck you have properly located the leak and moved away the stone in the right area. Now what are you looking for ? 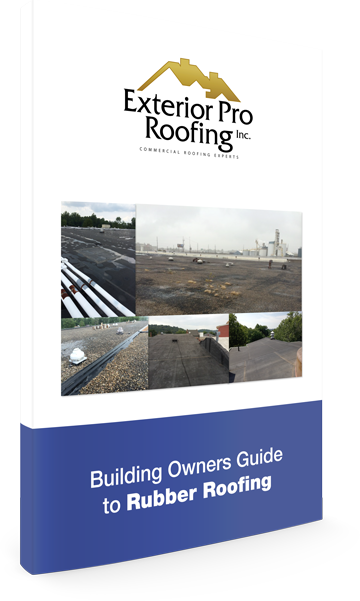 While there are no hard and fast rules we can provide you with of why rubber roofs leaks there are some general guide lines of what to look for once you have the rock removed. A. 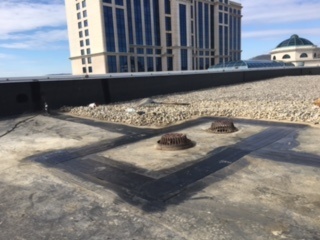 If the area of the rubber roof leak you located both inside and outside of the building is around mechanical equipment or pipe penetration such as HVAC units, Cooling towers, exhaust fans, plumbing stacks, or grease hoods, pay very close attention to the curb and stack flashings. Especially examine the corners on the rubber roof flashing but also look at the seam of the curb and the termination onto to curb. Also It is not uncommon to find puncture holes around mechanical equipment from previous maintenance work. Tools get dropped and screws get left on the roof only to be stepped on later down the road. B. If the area you located is not around any mechanical equipment or pipe flashings try to locate the nearest seam in the rubber roof to the leak. Pay close attention to the seam but especially on T lap area. A T lap is where three rubber roofing sheets meet up. If all the seams check out look closely for a pin hole or Puncture in the rubber. Holes are made in rubber roofing for many reasons and some times you get luck and find a “ smoking gun” quickly and easily in a hole or tear.